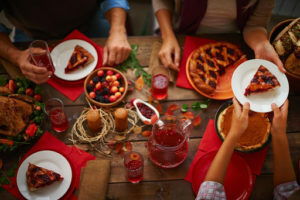 Sweet treats and rich meals can feel like landmines for health-conscious people, yet no one wants to feel deprived during the happiest season of all. For some there is often one meal, which is no big deal. Others have very large families, which means many meals that happen throughout the end of the year. No need to fear—there are sensible ways to navigate this territory. 1. Eat what you love, leave what you like. Don’t pile your plate miles high with things just because Aunt Nancy promises its ‘even better’ this year. Or things that don’t really tantalize your taste buds (I’m looking at you, fruit cake). If you’re not swooning, leave it on the sideline. Feeling guilty after eating foods you don’t usually allow yourself to eat can breed more unhealthy behaviors. So abandon those negative voices in your head, give yourself permission to enjoy the indulgence guilt-free, and then remember to get back on track with your normal eating routine the very next day. As I have written before, 20 minutes of eating isn’t going to cancel out the rest of the year of training hard and eating clean. Your body requires calories to burn calories. 3. Don’t eat it just because it’s holiday food. You can overdo it with the veggies and dip or creamy asparagus soup, just like you can with ice cream—except with the ice cream at least you know it’s an indulgence. So make sure you’re not eating something based solely on its health-food aura and keep an eye on your portion sizes. 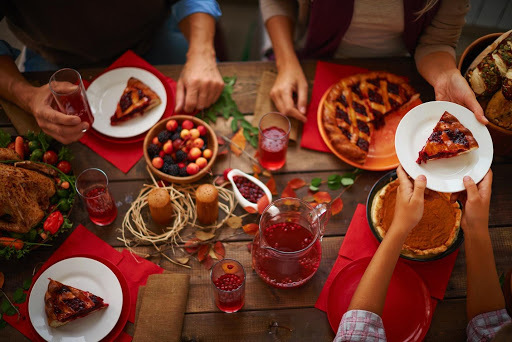 Whether it’s Grandma’s caramel cake or your best friend’s first attempt at a holiday roast, often you may feel forced to eat certain foods simply because people keep offering them to you. Put on a genuine smile, politely decline, and then offer a compliment. Make this a positive situation instead of letting it increase tension from others’ good intentions. An example can be; “Oh, these truffles look amazing, and you’re so thoughtful to make them for me! I’m too full to enjoy them right now, but could I take a couple home?” They’ll feel loved and you won’t feel pressured to show your affection through busting a gut. Don’t add more stress to an already stressful season. Take control of the situation and live! Click here for more info on NBS Nutrition.